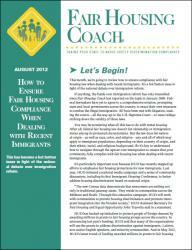 Sign up now for your 12-issue subscription to Fairhousingcoach.com to view the full lessons and quizzes each month online as well as receive the PDF versions of each issue by email. FairHousingCoach.com’s searchable archive contains five years of content, including past lessons and quizzes, arranged by management issues and protected classes. This monthly E-Alert provides late-breaking news and updates on fair housing-related regulations, market trends, and court decisions to help managers avoid lawsuits and implement best practices. 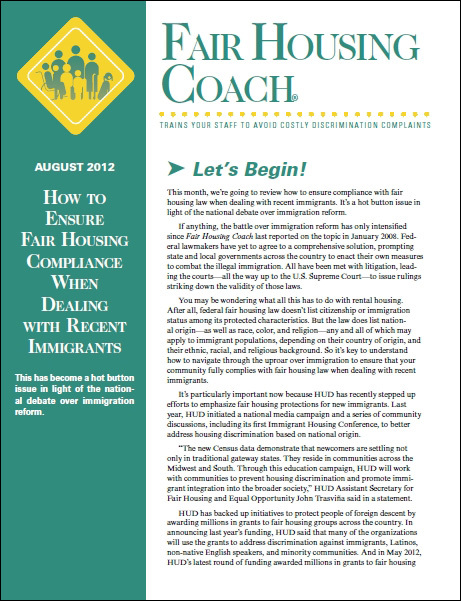 Every issue of Fair Housing Coach is delivered as a PDF right to your inbox, which can be easily printed or loaded onto a tablet and taken with you. Your satisfaction is guaranteed. If for any reason you are unhappy with your subscription, you may cancel at any time and receive a full 100% refund—no questions asked—for all remaining issues.